nah, that didn't happen, but it did get your attention. Although a pumpkin and a screwdriver did get together. We have busy lives and sometimes I don't have the time to really decorate the way I would like to. Still, that doesn't keep me from dressing up a pumpkin or two in the front of my home. We are talking simple...easy peasy stuff...less then 5 minutes and you are good to go kinda decorating. there you have it! Instant decor. Now clean off the screwdriver, put the tools back and admire your decorative work. Oh yea, lookin good mama! The month of September is quickly coming to an end. So hard to believe that October is just around the corner. 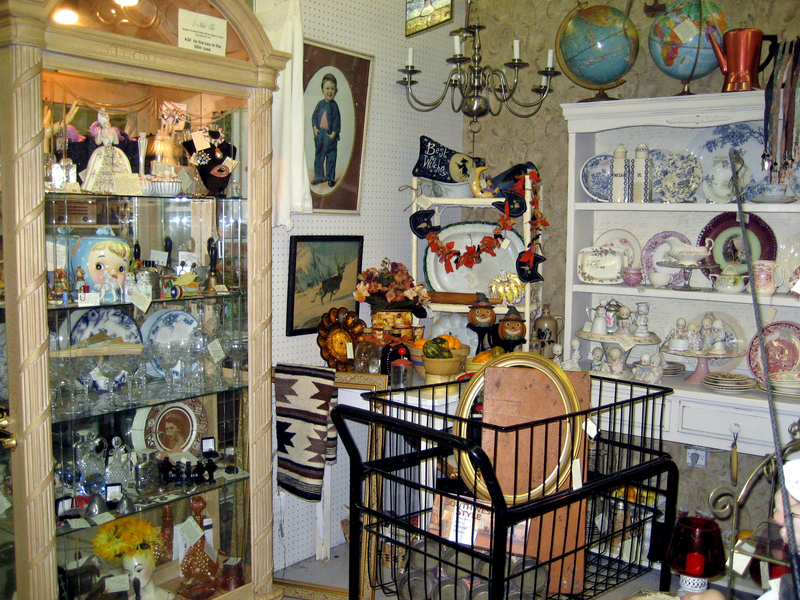 Sis and I had a lovely Saturday visiting Vintage Village as they had a parking lot sale going on and lots of Halloween items for sale in the store. Who can resist a parking lot sale on a beautiful Saturday so off we went to Snellville. Following a delicious lunch at Majong Chinese Restaurant of steamed pot stickers and crab rangoons covered in hot mustard we pulled into Vintage Village to do some shopping. VV is a cozy shop with approximately 50 dealers and I can always find a treasure or two or three. The front entrance of Vintage Village all tricked out for Halloween. Don'tcha just love it? I love the multi colored light bulbs and the glitter on the candles for this repurposed lamp. What fun. VV dealers know how to display well with tiny elements. Crazy about these Halloween lanterns. Love the crow. Scherenschnitte or paper cutting is always a pretty decorative item. More Halloween at its best. Two of my favorite dealers (Paul and Jeanine) they have such exquisite taste and are delightful people. I could live in their booths. They always have such lovely lighting pieces and at great prices. Take a pretty glass container and fill with tone on tone flowers. Lovely. Game birds turkey and peasant always dress a holiday table well. This is a new dealer at VV and she offers my favorites! 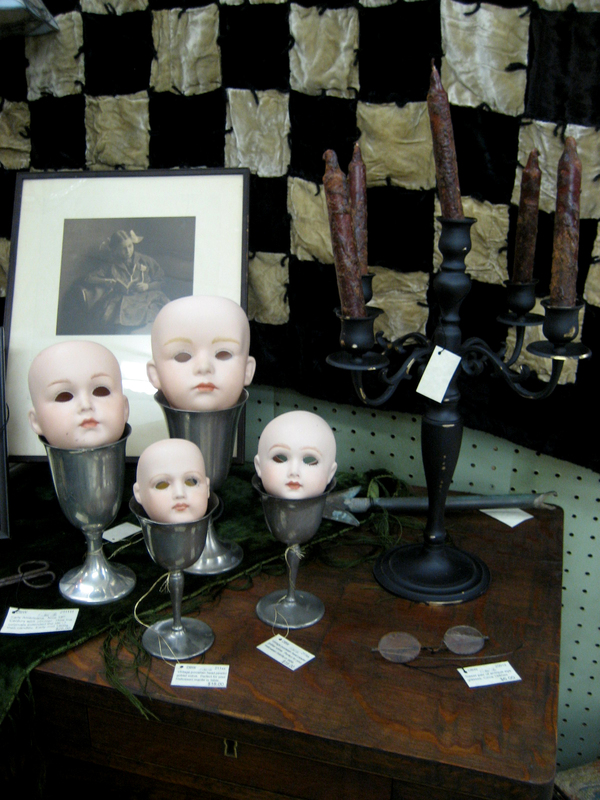 I adore American Primitive and I went a little Sea Witch mad in her booth. See that pretty heart shapped sewing box to the left of this photo? Well, it came home with me. I know $45.00 may seem a lot for a sewing box, but this is a Victorian piece and in a rare shape ... the heart. Inside it is a rich Victorian red lining. I am over the moon with this piece and it is in my personal collection. I adore women's needlewook tools and have been collecting them for decades. My collection is small but unique. Quad plate...be still my heart. This is why I came to VV today. I had heard that dealers had a boatload of it and they did. I walked away with a pretty pickle castor and a baby's cup. Still have my eye on the teapot in this group. I walked away with some neat items and Sis purchased home made apple cake from Miss Willie at the parking lot sale. 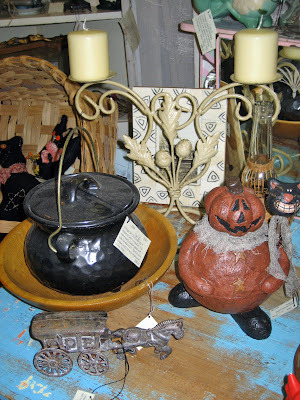 More black painted candlesticks and added the "cracked headlight" to my table of Halloween decor. This is one of my favorite pieces as well. I have a thing for doll heads in cups and bases...has an interesting creep factor to it. LOL Reminds me of the design elements one would find in the old HBO series, Carnivale. How I miss that show. 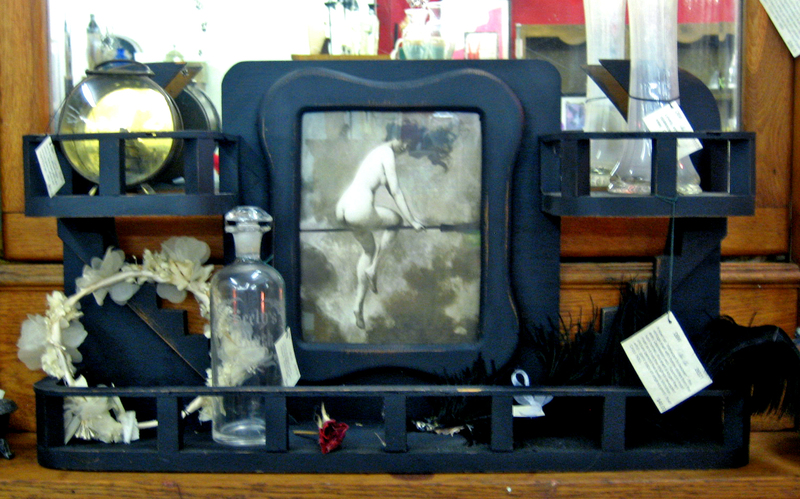 Added a few of my usual witchy photos to vintage frames. Purchased this set of leather bound and marble papered books. Classic tales and original, publishers deluxe binding from 1935. Sold all of the black spray painted candlesticks/candelabras I had brought in last week so I had to find and paint a few more. These have proven to be very popular this year. A fantastic find. Lovely tiffany style stained glass lamp and base. Nice table size and the base lights up. I love metal ornamental pieces and this piece is a marvelous depiction of an 18 century Woodland Tribe American Indian. A smaller metal American Indian that is free standing. I like the way it looks among the fall items. Nothing like witches flying around on brooms with candle light behind them. Ten minutes after I displayed this, it was sold. A new hat for my gal. Nice Mr. John, Jr. mohair hat with rhinestones and french jet glass beads. Very 1960s. Sold the stained glass lamp shortly after I set up this display so I added the Victorian print of the praying girls. I think it is a neat compliment to the heads. LOL While I was setting up this display, someone calls my name and I turn to see it is Barbara...the neat gal sis and I met at Hobby Lobby last week. She came through Queen of Hearts for a little shopping and she saw me fluffing up my Victorian booth. I love the small world that we live in. 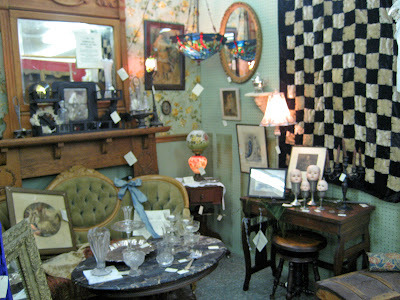 This was a great day to be working in my booths as I seemed to sell items as quickly as I set up the displays. 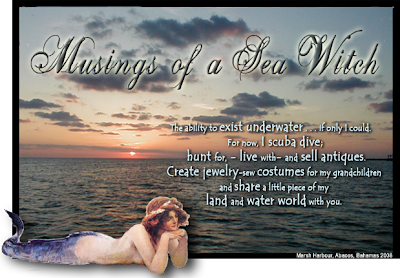 It's a new look for Musings of a Sea Witch. 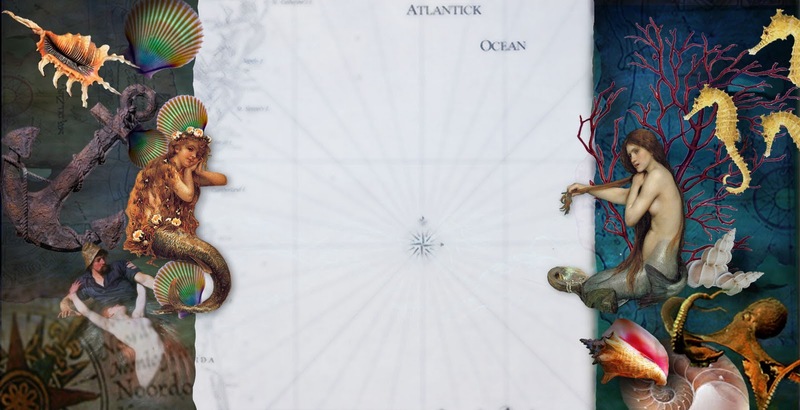 I have been wanting to update my background for a few months now but wanted to keep my sea witchy look with Victorian and the Romantics mermaid art. Additionally, I wanted to add the color of the sea with its beautiful shells and sea creatures. I utilize three different size monitors at work and each one has a different display size. Depending on what display size you utilize on your monitor will determine if you see the entire background as shown above. A new background called for a new header. Not a lot of change here because I like the idea of switching out photos I have taken of the sea. 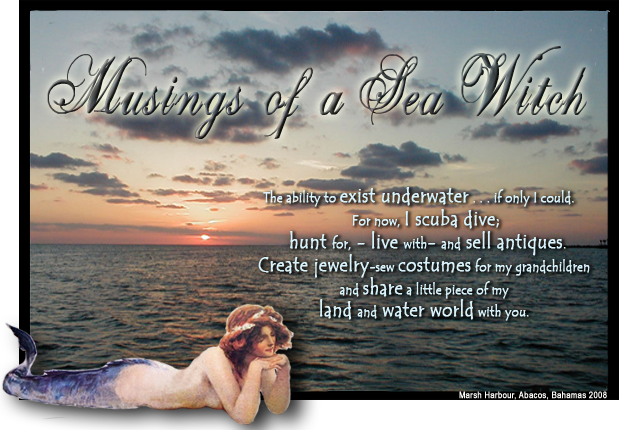 Saw this Victorian Pears mermaid ad and know exactly how she feels. This is my heart when I'm feeling the need to be in the sea again. It was a wonderful Saturday spent with Sis as we hit a couple of my favorite haunts for treasure as well as the fabric stores for ravioli Halloween costume making. Fall weather has hit the south and we had a lovely day in the 70s with cool breezes. 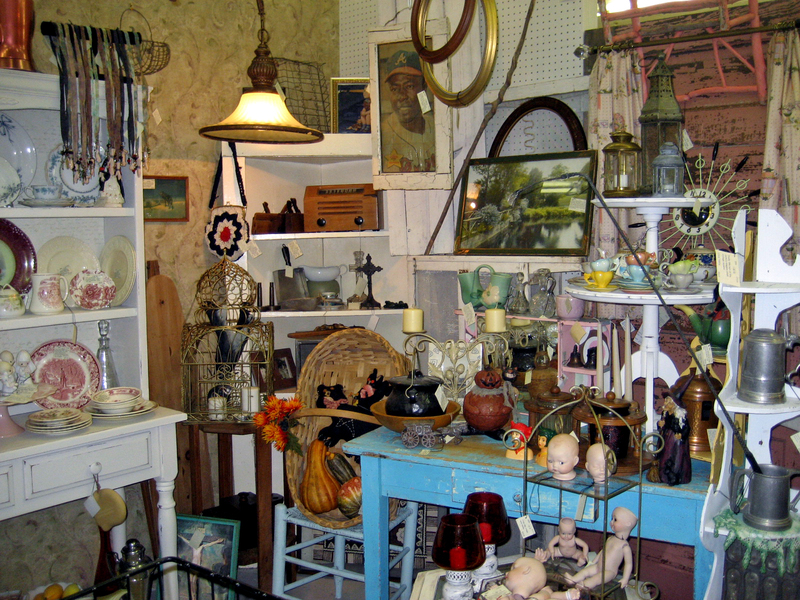 Perfect for a little junkin and shopping. 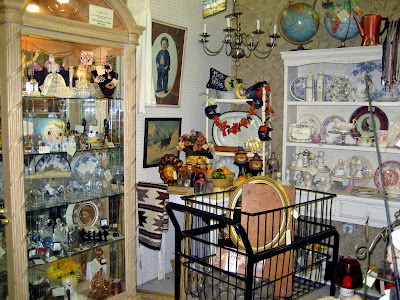 Found a few things at my haunts but got so busy prepping for my booths that I forgot to photograph them. I'm such a blonde at times. So instead, I have some photos of my "getting ready for Halloween" booth plump ups. 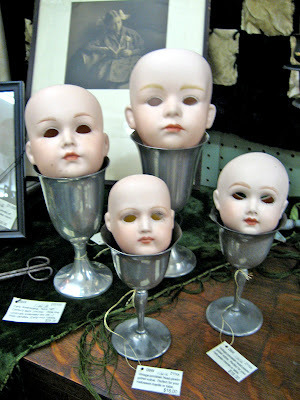 A few posts back I mentioned I had a special use for a few of the remaining porcelain doll heads. Well here they are. Nothing like floating heads with empty eyes that look smashing with a glow stick or votive candle lit behind them sitting in vintage pewter goblets. Oh, yea...I'm digging this. Welcome to my kind of Halloween. MHHAAAAahhhhhhaawwwww! My favorite Victorian witch is back and I filled this vintage "Stairway to Heaven" with an antique ostrich feather, antique wax flower wedding headpiece, Victorian etched liquor bottle and other Victoriana. Love the look. I may have to go back and reprice this higher so if it doesn't sell, I won't mind. 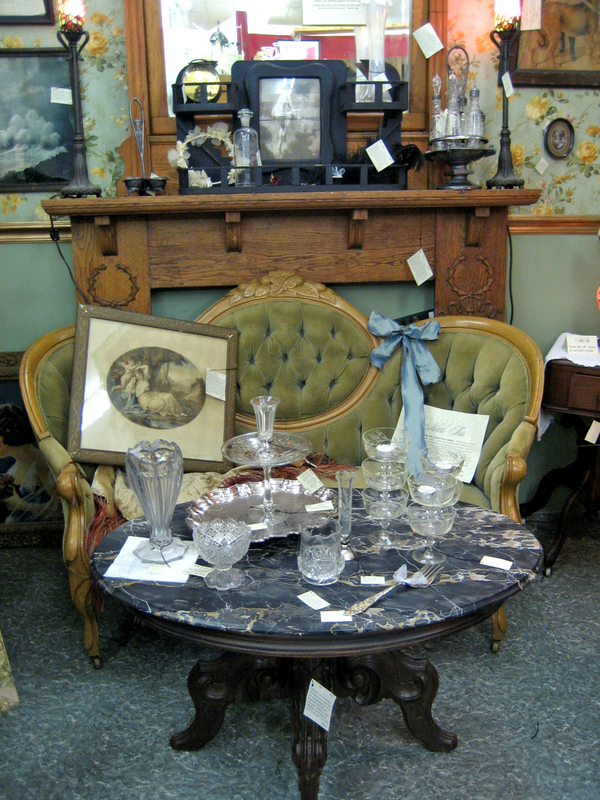 Photo of the black marble table. I'm going to fill this with more Halloween items next week. You can't see it well from this photo, but the bright glow from the table lamp was a weekend find. Lovely antique gold on silver and white lamp with beautiful tone on tone stained glass shade. It looks wonderful on the doll's heads table. It's sweater season and this classic argyle from Mark Berman is as soft as cashmere. 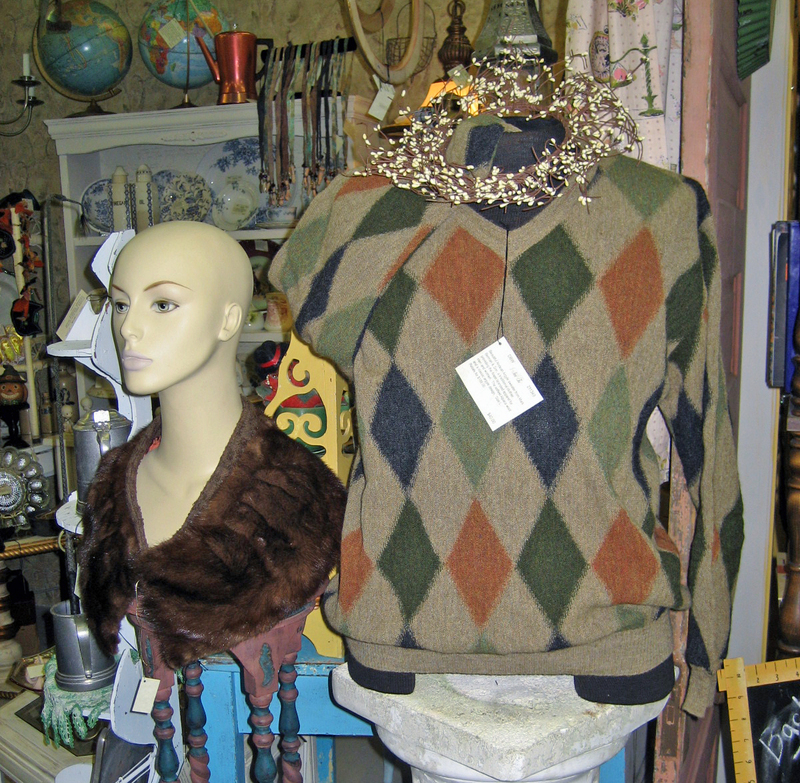 Perfect for football games and a pretty mink collar for "Miss Sassy". I had a nice fur hat for "Sassy" but it sold shortly after I put it on her. Check out the nifty vintage Log Cabin Syrup bottles with the faux wood screw tops. All from 1976 with Bicentennial impressions on each. 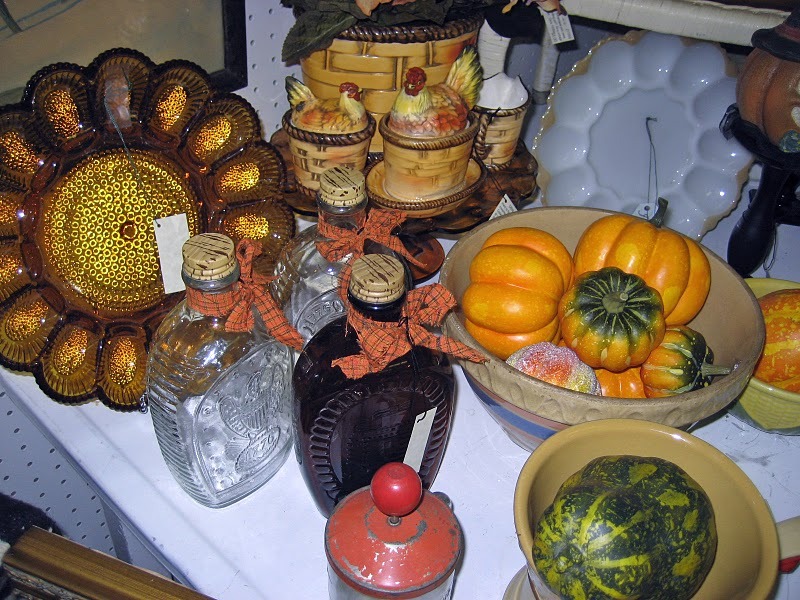 Behind the bottles is a fantastic Lefton "Hen on basket" set. The only thing missing was the cookie jar lid so I filled it with fall flowers instead. Bottles and hens were weekend finds. I love a fall table, don't you? A better shot of the completed table for fall and Halloween. I can never, ever have enough deviled egg trays. They sell faster than I can ever find them. This huge hand made splint basket is what brought home all of those doll body parts a few months ago. 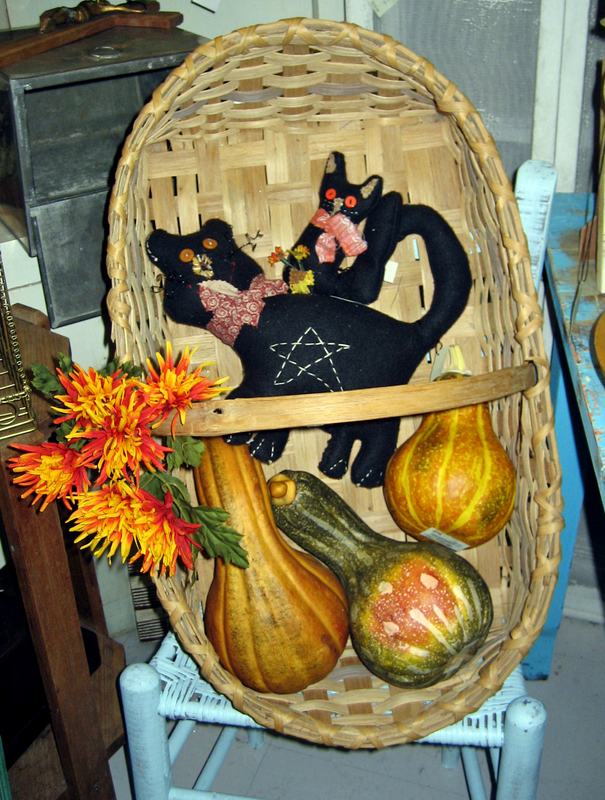 Now it is filled with giant faux gourds and pretty Primitive Black Cats. I love the way the fall colors play off of the faded sea blue-green straightback chair. 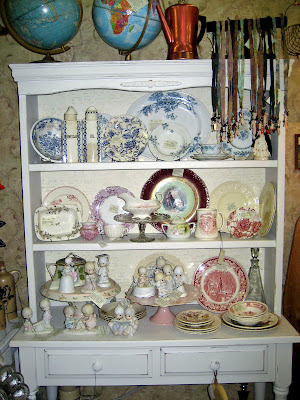 I moved my white shelf to the back middle of the booth to open the booth up as I ready for holiday displays. I wish I had more transferware to offer. I have sold off most of what I have so I added vintage cake plates and moved the Precious Moments from the tea table to this shelf. Blue table moved to the right and filled with treasure. Photo of the other side and my nifty black cart. I sell more stuff out of that cart. I refilled it up again. People love to root through things like this. A cauldron cookie jar and a pumpkin head candy dish. Works for me. 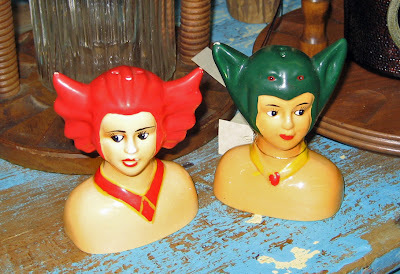 Okay, sometimes you just need a little weirdness at the table. I have no idea what these two gals are, but they look like they just ran off of a bad Japanese monster "B"movie. Can you imagine the family conversation at the Thanksgiving table when people ask why the two weird gals instead of the usual turkey S & P's? 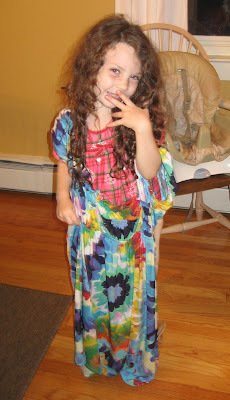 Headed out to Hobby Lobby to find fabric to make fairy costumes for Kit Kat and Kells Bells. Didn't find what I was looking for, but had a marvelous time looking over the holiday decor. Sis and I love to talk to anyone who will listen and before I knew it we had made friends with a lovely woman named Barbara. So here is a shout out to Barbara and hope she used the 40% off coupon we passed on to her for something wonderful. After the junkin and shopping, Sis and I needed a pick me up so off to our favorite coffee shop...Mozart's Bakery. A marvelous, Korean run coffee shop that is artsy, quiet and has exquisite desserts. I had my favorite...Chocolate Mirror. 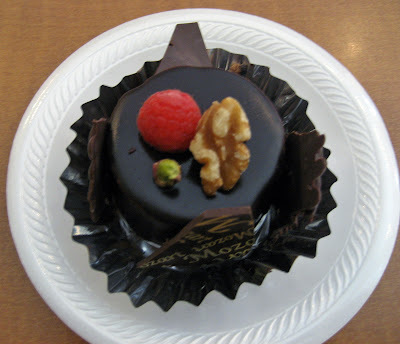 Rich chocolate ganache cake laced with a spot of raspberry preserves and a hazelnut cream inside. Enrobed in a rich but very thin layer of dark chocolate and then decorated with decadent designer chocolate bark with a fresh raspberry, pistachio and walnut meat on the top. Oh, be still my heart. From Mozart's, we hauled over to JoAnn's Fabrics. As you know, my Kit Kat is very specific about how her costumes are to be designed. I scored with every fabric and embellishment I was looking for so it's costume creating time this week. Now you know why I am such a sucker for this child. Look at that sweet face. She was in her nightgown and was going through my luggage to see what clothes and shoes I had brought for my recent visit. She liked the colors on this summer dress and asked if she could try it on. Of course you can and she giggled with delight and then put on my Cinderella shoes (they are clear and covered in clear sparkly glitter) and walked to the breakfast table that way. Her mom and dad were rolling with laughter. I just realized as I hit the new post tab that this is my 300th post! Wow, hard to believe that I have made 300 posts and folks actually came to read them. Thank you everyone, for your support and your wonderful comments. I look forward to posting another 300. Fall is just around the corner as our hot Southern nights are now in the 60s with a nice breeze. Leaves are just beginning to show a color change or two and Queen of Hearts has begun to decorate with the colors and style of Indian Summer and Autumn. There is such a comfort feel to this season. It always invokes the nest in-instinct; family and friends sharing around the kitchen or cozied up on the sofa with warm blankets, the family pet and perhaps a snuggie or two with the kids. One of my favorite dealers at the Queen in Buford has a marvelous sense of style. She takes the simplest elements and places them beautifully in a myriad of containers. Vintage bases from lamps and urns become beautiful mounts for pumpkins and drieds. Her booth, always beautiful...I can take everything home she creates or finds. How sweet are these little paper mache candy holders? Too cute. These ghostie bad boys are about 2 feet in length and spin silently on nylon from the ceiling. 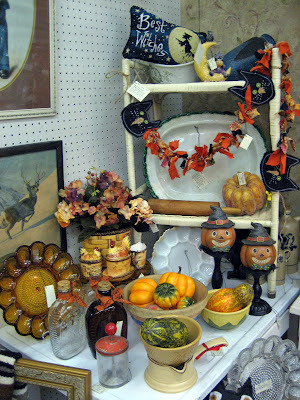 Some of my favorite things, chippy aqua blue table with an antique treenware bowl filled with white pumpkins. At the front entrance to the Queen of Hearts, a splendid table set for Thanksgiving. Love the use of the tossed antique quilt as the centerpiece.